For-profit private prison companies have been showering members of Congress with campaign cash, while simultaneously lobbying lawmakers on immigration detention matters. With huge amounts of cash and incentives for pay-to-play arrangements flowing between politicians and the industries they regulate, it is little wonder that voters believe their elected representatives are more attuned to the priorities of big-money corporate interests than to everyday Americans. It is time to adopt bold anti-corruption solutions to help rein in the power of wealthy special interests so that the views and priorities of the general public are more fairly represented when their government formulates important policies. Public outrage over the administration’s callous policy was loud and swift. Under extreme pressure, President Trump issued an executive order on June 20, 2018, shifting gears away from ripping children from their parents—and instead toward incarcerating families together, perhaps for indefinite time periods.7 Yet imprisoning entire families not only is an inhumane and unnecessary alternative to separating families; it also results in directing billions of federal taxpayer dollars to the nation’s two largest private prison companies, both of whose bottom lines benefit from increased detention. 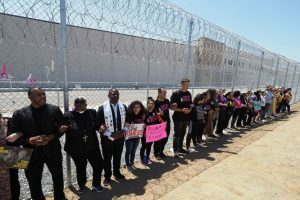 ICE contracts with private prison companies often include fixed prices, meaning private prison companies are paid whether or not detention space is used.11 This creates an incentive for these companies to encourage surplus detention capacity regardless of actual need, another illogical policy consequence. The private prison industry is lucrative, and its largest companies—GEO Group and CoreCivic—spend big money in politics to promote their business interests. They do this chiefly by contributing millions of dollars to help elect federal candidates who will support their lifeblood and by hiring well-connected lobbyists to advocate for their preferred policies.18 It’s the epitome of the so-called “swamp” that President Trump claimed he will drain. GEO Group and CoreCivic now stand to profit handsomely from immigration policy decisions made by Trump and congressional Republicans. Both are advancing policy decisions that are steering immigrants into detention centers at higher rates, including into centers designed to detain children. Private prison companies such as GEO Group and CoreCivic have huge influence over policymakers. This is not surprising given the current campaign finance and lobbying laws, which engender a pay-to-play system that skews policymaking toward corporate interests and fails to fairly represent the viewpoints of everyday Americans. The primary way to reduce the undue influence of powerful special interests and strengthen the voices of everyday citizens is to restructure U.S. laws so that the public is more fairly represented when policies are made. To achieve this popular and necessary goal, CAP supports several strong, clear anti-corruption solutions. One bold anti-corruption solution is to bar members of Congress from accepting contributions from entities with interests in front of legislative committees on which members sit. Under this proposal, private prison companies such as GEO Group and CoreCivic would be prohibited from donating campaign cash to members of the House Appropriations Committee or its Homeland Security subcommittee, both of which make legislative decisions that directly affect the companies’ bottom lines. Another strong, clear anti-corruption solution is to ban lobbyists from fundraising for politicians.50 Under this policy, lobbyists hired by private prison companies, for example, would be prohibited from fundraising for candidates or political parties. This solution is necessary to ending one of the most direct ways that special interests attempt to buy favorable treatment from lawmakers who are supposed to develop policies to benefit all Americans. Although lobbyists are subject to the same contribution limits as other donors—$2,700 per candidate per election—many lobbyists provide far more financial support to politicians by holding fundraising events and bundling contributions from other donors.51 This, in turn, increases lobbyists’ ability to gain access to politicians as they advocate on important issues—in this case, detention-related issues. Mick Mulvaney, currently the director of President Trump’s Office of Management and Budget, admitted that lobbyists bought access to his office. He publicly stated that when he was a congressman, lobbyists could secure a meeting with his office if they donated to his re-election campaign.52 When a lobbyist solicits additional campaign funds for politicians, that lobbyist’s access grows. Just as importantly, every time the president’s team or a member of Congress meets with a powerful lobbyist who has fundraised for them, it decreases the opportunity to meet with the general public, which often approaches policies differently than wealthy special interests. This misalignment can skew policy outcomes, as evidenced by the government’s current cruel and illogical detention policy. To further curb corrupting influences, Congress should require more transparency and accountability over political spending so voters know who is attempting to affect election outcomes. Since 2008, anonymous donors, including corporations, have spent significantly more than $900 million on federal elections.53 Passage of the DISCLOSE Act of 201854 would be a big step forward, mitigating one of the harmful effects of the U.S. Supreme Court’s 2010 decision in Citizens United. This legislation would allow the public to know where campaign cash is coming from, whether it be from corporations, wealthy special interests, or American citizens. By contrast, under the current system, there is no way to know whether GEO Group and CoreCivic are anonymously funneling large sums of money to outside groups to influence elections and policies. The DISCLOSE Act of 2018 would close loopholes that shield powerful corporations from disclosure, including by prohibiting donors from hiding their identities behind shell organizations. It also would require organizations that engage in significant election-related spending, including shadowy tax-exempt nonprofits, to promptly report that activity. Public disclosure of the sources of political spending is essential to uncovering corruption, educating voters, conducting elections that are open and informed, and yielding responsive policymaking. The FEC should robustly enforce laws to ensure that companies with federal contracts, such as private prisons, do not make improper political donations. The federal government spends hundreds of billions of dollars every year on contracts with private companies, and the public deserves to know that the government is awarding these contracts on merit, not because of a company’s political donations or connections. As discussed above, companies such as GEO Group are testing the outer limits of prohibitions on contractor spending in elections, often funneling money through subsidiaries—yet the FEC is failing to act. Unless existing restrictions are meaningfully scrutinized and enforced, contractors’ election spending will continue to produce a pay-to-play culture that favors big corporate donors instead of companies that can best and most cost-effectively meet the public’s needs. Our current political system breeds a culture of corruption that often benefits wealthy special interests over everyday Americans. Using powerful levers such as campaign contributions and lobbying, private prison companies are benefiting handsomely from the inhumane and illogical immigration detention policies of President Trump and congressional Republicans. With the public’s outcry as their motivation, lawmakers should enact clear, strong anti-corruption solutions that curb the power that special interests have over government policymaking. Only when our government fairly represents the views of all Americans will our nation be one that is of the people, by the people, and for the people. Information is obtained by author conducting relevant searches on OpenSecrets.org. See Center for Responsive Politics, OpenSecrets.org, “Home,” available at https://www.opensecrets.org (last accessed July 2018). See Geoff West and Alex Baumgart, “‘Zero-tolerance’ immigration policy is big money for contractors, nonprofits,” Center for Responsive Politics, OpenSecrets.org, June 21, 2018, available at https://www.opensecrets.org/news/2018/06/zero-tolerance-immigration-is-big-money-for-contractors-nonprofits/. Roque Planas, “Trump’s Family Detention Policy Will Cost Billions Of Dollars That ICE Doesn’t Have,” HuffPost, June 26, 2018, available at https://www.huffingtonpost.com/entry/trump-family-detention-policy-cost-billions-dollars-ice_us_5b3186eae4b0b5e692f0ba3f. Tara Tidwell Cullen, “ICE Released Its Most Comprehensive Immigration Data Yet. It’s Alarming,” National Immigrant Justice Center, March 13, 2018, available at https://immigrantjustice.org/staff/blog/ice-released-its-most-comprehensive-immigration-detention-data-yet; John Burnett, “Big Money As Private Immigrant Jails Boom,” NPR, November 21, 2017, available at https://www.npr.org/2017/11/21/565318778/big-money-as-private-immigrant-jails-boom. U.S. Department of Justice Office of Public Affairs, “Attorney General Announces Zero-Tolerance Policy for Criminal Illegal Entry,” Press release, April 6, 2018, available at https://www.justice.gov/opa/pr/attorney-general-announces-zero-tolerance-policy-criminal-illegal-entry. Renuka Rayasam, “Asylum seekers sue administration over ‘zero tolerance’ policy,” Politico, June 20, 2018, available at https://www.politico.com/story/2018/06/20/immigration-asylum-seekers-zero-tolerance-641181. Sharita Gruberg, “Trump’s Executive Order Rewards Private Prison Campaign Donors,” Center for American Progress, June 28, 2018, available at https://www.americanprogress.org/issues/immigration/news/2018/06/28/452912/trumps-executive-order-rewards-private-prison-campaign-donors/. The White House, “Executive Orders: Affording Congress an Opportunity to Address Family Separation,” June 20, 2018, available at https://www.whitehouse.gov/presidential-actions/affording-congress-opportunity-address-family-separation/. Rob Urban and Bill Allison, “Prison Operators Could Cash In on Trump’s ‘Zero Tolerance’ Immigration Policy,” Bloomberg, June 28, 2018, available at https://www.bloomberg.com/news/articles/2018-06-28/prison-operators-gain-as-u-s-immigration-detentions-surge. Urban and Allison, “Prison Operators Could Cash In on Trump’s ‘Zero Tolerance’ Immigration Policy”; Sharita Gruberg and Tom Jawetz, “How the U.S. Department of Homeland Security Can End Its Reliance on Private Prisons,” Center for American Progress, September 14, 2016, available at https://www.americanprogress.org/issues/immigration/news/2016/09/14/144160/how-the-u-s-department-of-homeland-security-can-end-its-reliance-on-private-prisons/. Freedom for Immigrants, “Detention by the Numbers,” available at https://www.freedomforimmigrants.org/detention-statistics/ (last accessed July 2018). Chico Harlan, “Inside the administration’s $1 billion deal to detain Central American asylum seekers,” The Washington Post, August 14, 2016, available at https://www.washingtonpost.com/business/economy/inside-the-administrations-1-billion-deal-to-detain-central-american-asylum-seekers/2016/08/14/e47f1960-5819-11e6-9aee-8075993d73a2_story.html?utm_term=.f6eda22b45e3. U.S. Immigration and Customs Enforcement, Budget Overview, Fiscal Year 2019 Congressional Justification (U.S. Department of Homeland Security, 2018), available at https://www.dhs.gov/sites/default/files/publications/U.S.%20Immigration%20and%20Customs%20Enforcement.pdf. Leila Schochet, “Trump’s Family Incarceration Policy Threatens Healthy Child Development” (Washington: Center for American Progress, 2018), available at https://www.americanprogress.org/issues/early-childhood/reports/2018/07/12/453378/trumps-family-incarceration-policy-threatens-healthy-child-development/?utm_source=newsletter&utm_medium=email&utm_campaign=progReport; Gruberg, “Trump’s Executive Order Rewards Private Prison Campaign Donors”; Jason Fernandes, “Alternatives to Detention and the For-Profit Immigration System,” Center for American Progress, June 9, 2017, available at https://www.americanprogress.org/issues/immigration/news/2017/06/09/433975/alternatives-detention-profit-immigration-system/. 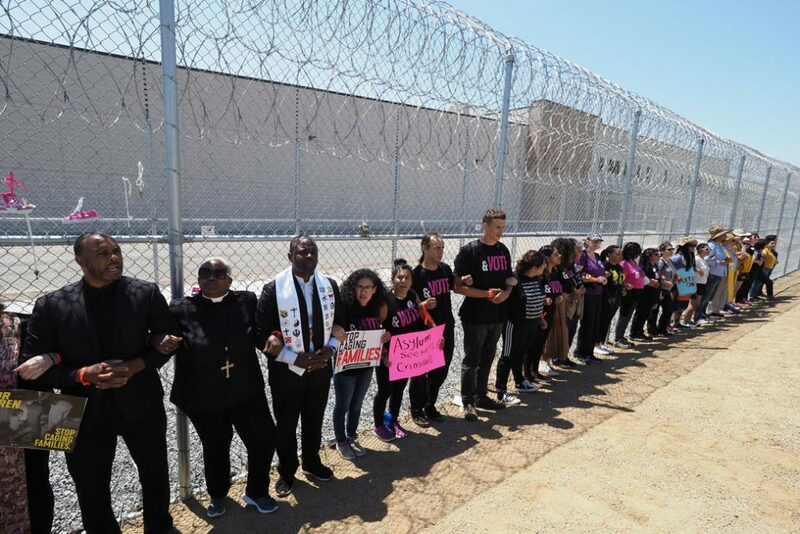 This publication does not address the significant expenditures these companies make at the state or local levels, whose laws do not generally control immigration detention policy. Paul Blake, “DHS Reviewing ICE Use of Private Prisons,” ABC News, August 29, 2016, available at https://abcnews.go.com/US/dhs-reviewing-ice-private-prisons/story?id=41723825. Evelyn Cheng, “Prison stocks plunge after report Justice Department will end use of private prisons,” CNBC, August 18, 2016, available at https://www.cnbc.com/2016/08/18/prison-stocks-plunge-after-report-justice-department-will-end-use-of-private-prisons.html. Alex Baumgart, “Companies that funded Trump’s inauguration came up big in 2017,” Center for Responsive Politics, OpenSecrets.org, January 19, 2018, available at https://www.opensecrets.org/news/2018/01/companies-that-funded-trumps-inauguration/. Amy Brittain and Drew Harwell, “Private-prison giant, resurgent in Trump era, gathers at president’s resort,” The Washington Post, October 25, 2017, available at https://www.washingtonpost.com/politics/with-business-booming-under-trump-private-prison-giant-gathers-at-presidents-resort/2017/10/25/b281d32c-adee-11e7-a908-a3470754bbb9_story.html?noredirect=on&utm_term=.b5c4a6801df5; information is obtained by author conducting relevant searches. See Center for Responsive Politics, OpenSecrets.org, “Home”; Federal Election Commission, “Home,” available at https://www.fec.gov (last accessed July 2018). Keegan Hamilton, “Pay to play? The giant private prison operator GEO Group may have illegally funded a Donald Trump super PAC,” Vice News, December 20, 2016, available at https://news.vice.com/en_us/article/evaj4j/geo-group-may-have-illegally-funded-a-trump-super-pac. See Liz Kennedy and Alex Tausanovitch, “Secret and Foreign Spending in U.S. Elections: Why America Needs the DISCLOSE Act” (Washington: Center for American Progress, 2017), available at https://www.americanprogress.org/issues/democracy/reports/2017/07/17/435886/secret-foreign-spending-u-s-elections-america-needs-disclose-act/. Michael Cohen, “How for-profit prisons have become the biggest lobby no one is talking about,” The Washington Post, April 28, 2015, available at https://www.washingtonpost.com/posteverything/wp/2015/04/28/how-for-profit-prisons-have-become-the-biggest-lobby-no-one-is-talking-about/?utm_term=.427754b04540. Although GEO Group and CoreCivic spend generously on lobbying, including on homeland security appropriations issues—as discussed in this brief—the companies state that they do not lobby broadly on immigration policy. For example, GEO Group maintains that it does not advocate for or against immigration policies, such as whether or not to criminalize certain behavior or the basis for or length of an individual’s detention. See Urban and Allison, “Prison Operators Could Cash In on Trump’s ‘Zero Tolerance’ Immigration Policy.” Instead, GEO Group says that its lobbying focuses on “promoting the benefits of public-private partnerships in the delivery of secure residential care in correctional and detention facilities.” See Dean DeChiaro, “Private Prisons Boost Lobbying as Federal Detention Needs Grow,” CQ/Roll Call, October 25, 2017, available at https://www.rollcall.com/news/politics/99602-2. Similarly, CoreCivic maintains that it does not lobby on “policies or legislation that determine the basis or duration of an individual’s incarceration or detention.” See Ben Protess, Manny Fernandez, and Kitty Bennett, “Some Contractors Housing Migrant Children Are Familiar to Trump’s Inner Circle,” The New York Times, July 4, 2018, available at https://www.nytimes.com/2018/07/04/us/migrant-families-contractors-campaign-contributions.html. Sharita Gruberg, “How For-Profit Companies Are Driving Immigration Detention Policies” (Washington: Center for American Progress, 2015), available at https://www.americanprogress.org/issues/immigration/reports/2015/12/18/127769/how-for-profit-companies-are-driving-immigration-detention-policies/. Information is obtained by author conducting relevant searches. 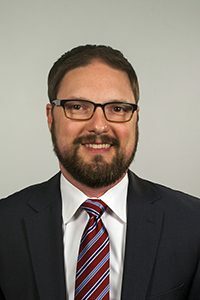 See Center for Responsive Politics, OpenSecrets.org, “Home.” Although Brian Ballard had lobbied for GEO Group in Florida, in 2017, he began to lobby for them in Washington, D.C. See Fredreka Schouten, “Pro-Trump lobbyist lands big clients for new D.C. office,” USA Today, February 15, 2017, available at https://www.usatoday.com/story/news/politics/onpolitics/2017/02/15/pro-trump-lobbyist-lands-big-clients-new-dc-office/97970168/. Isaac Arnsdorf and Brianna Gurciullo, “Downtowners headline Rubio fundraiser,” Politico, June 29, 2016, available at https://subscriber.politicopro.com/tipsheets/politico-influence/2016/06/downtowners-headline-rubio-raiser-dentons-says-it-can-lobby-every-state-capital-fti-hires-gmas-darragh-018044. Information is obtained by author conducting relevant searches. See Federal Election Commission, “Schedule A: Reportable Bundled Contributions Forwarded by or Credited to Lobbyist/Registrants and Lobbyist/Registrant PACs,” available at http://docquery.fec.gov/cgi-bin/forms/C00000935/1224496/sa/3L (last accessed July 2018). Center for American Progress, “Committee Contributions Ban” (2017), available at https://www.americanprogress.org/issues/democracy/reports/2017/11/30/443502/committee-contributions-ban/. See also Michael Beckel and Meredith McGehee, “The Price of Power: A deep-dive analysis into how political parties squeeze influential lawmakers to boost campaign coffers” (Washington: Issue One, 2017), available at https://www.issueone.org/wp-content/uploads/2017/05/price-of-power-final.pdf. Center for American Progress and Gerstein/Bocian/Agne poll, November 2016, on file with author. Center for American Progress, “Ban Lobbyists from Fundraising for Politicians” (2018), available at https://cdn.americanprogress.org/content/uploads/2018/04/25080206/TausanovitchLobbyingFundraising-factsheet11.pdf; Center for American Progress, “Fighting Special Interest Lobbyist Power Over Public Policy” (2017), available at https://cdn.americanprogress.org/content/uploads/2017/09/26125400/LobbyingSpecialInt-factsheet1.pdf. See Paul Lewis and Will Tucker, “Lobbyists bundle big money for Clinton, Bush,” Center for Responsive Politics, OpenSecrets.org, July 16, 2015, available at https://www.opensecrets.org/news/2015/07/lobbyists-bundle-big-money-for-clinton-bush/. Glenn Thrush, “Mulvaney, Watchdog Bureau’s Leader, Advises Bankers on Ways to Curtail Agency,” The New York Times, April 24, 2018, available at https://www.nytimes.com/2018/04/24/us/mulvaney-consumer-financial-protection-bureau.html?smid=tw-nytimes&smtyp=cur. DISCLOSE Act of 2018, S.3150, H.R.6239, 115th Cong., 2d sess. (June 27, 2018). Originally published by Center for American Progress with permission for non-commercial purposes.